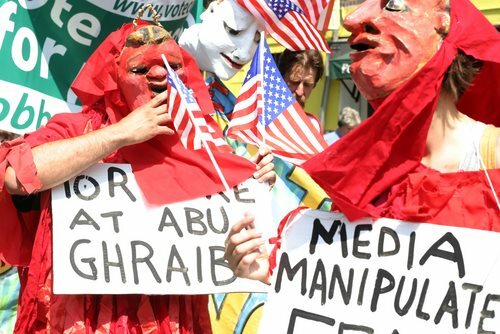 The Taguba Report investigated the alleged abuse and torture that occurred at the Abu Ghraib Prison in Iraq. American soldiers with the 320th Military Police Battalion were charged by the Department of Defense for the crimes, and a total of 11 soldiers faced courts martial and military prison time. The crimes listed in the Taguba report directly violated terms under the Geneva Conventions. The Office of the Secretary of Defense and Joint Staff describes the violations in sections 6 and 8 of Part One of the AR-15 (Finding and Recommendations), aka the Taguba Report. Section 8 describes other violations that include breaking chemical lights and pouring phosphoric on detainee, sodomizing a male detainee with a chemical light, repeated threats with work dogs, and more. The Taguba Report severely damaged the United State’s reputation in the eyes of local Iraqis and allies around the world as well. The U.S. military saw a huge backlash from the Arab community after the report surfaced.